They can cause the Volcano to shake with an Earthquake! Visitors can cause Lava to flow out of the Caldera and run down the outside of the Volcano in numerous streams! We cause the Lava to look like it is flowing through our artistic use of lots of L.E.D. lights, delivering a very intriguing and magical experience. The interactive that causes the Volcano to quake is not shown here, but it is intriguing, clever, and a lot of fun to manipulate. designed to fit in a corner. Well, actually the Earthquake is real, but the Lava is not. 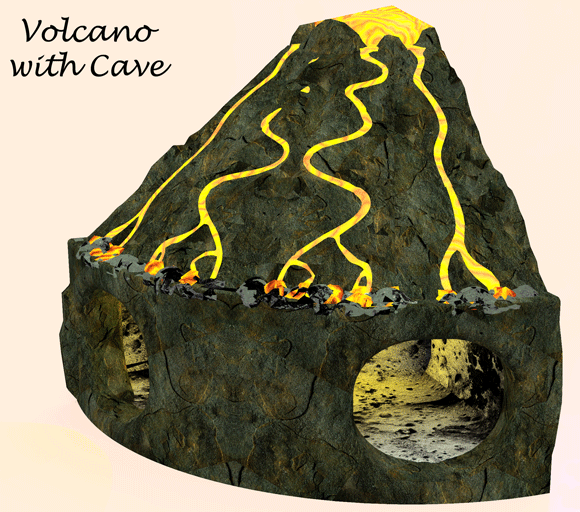 Visitors can crawl inside the cave and see Lava rising up inside a Magma Tube! But the Lava looks real enough, and it does emit a lot of light, and it does appear to flow up the Magma Tube inside the Volcano, and it does appear to flow out of the Caldera and down the outside of the Volcano. But the Lava is not a liquid, it is solid, and it is not hot (it is always room temperature).